HANSCOM AFB, MA (December 18, 2017) — The annual Hanscom FCU Employee Holiday Raffle raised over $10,000 for A Bed for Every Child, an initiative of the Massachusetts Coalition for the Homeless. The raffle generated $5,200, an amount matched by the Credit Union for a total donation of $10,400. Advocates with the Massachusetts Coalition for the Homeless, working with the public schools to assist families at risk of homelessness, learned that many children struggle in school because they do not get a good night’s sleep. For many, the reason is that they do not have their own beds. As a result, the Coalition launched A Bed for Every Child to provide beds for children in need. 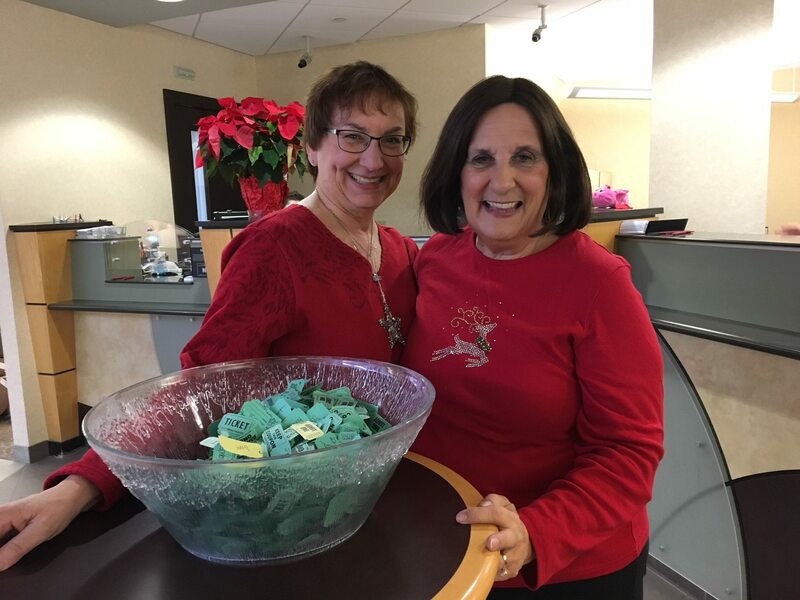 Hanscom FCU elves Deb and Elaine conducted the 2017 Employee Holiday Raffle. The annual event raised $5,200 for A Bed for Every Child, an initiative of the Massachusetts Coalition for the Homeless. Through these efforts, 40 children in need will receive a new bed.